If the Internet were freaking out about a photo of me, I'd definitely take notice and bask in the glow of adoration (or avoid reading Every. Single. Comment. because people are mean). 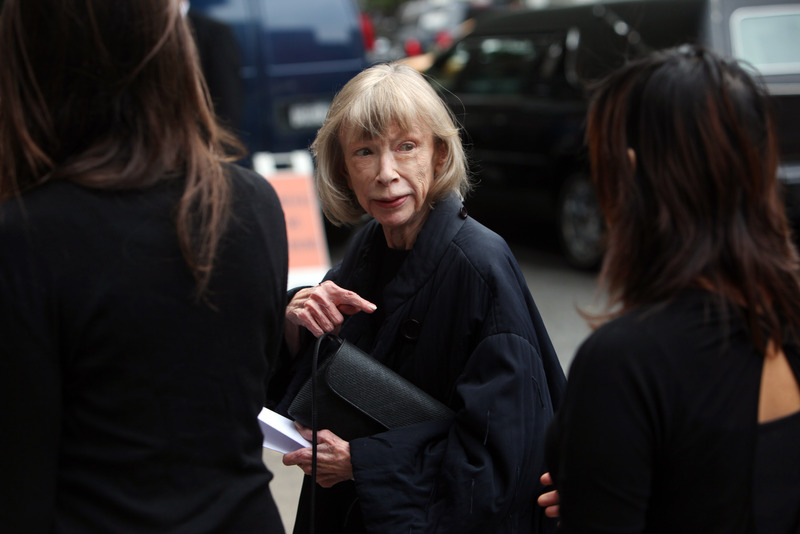 But when the Web rejoiced over Joan Didion's ad for Céline, the legendary author was naturally too cool to notice. According to the New York Times, Joan Didion was totally unaware that we all freaked out about her photo for the fashion house. Alexandra Jacobs of the Times called the 80-year-old writer to discuss the ad campaign that's been on everybody's mind since Vogue announced it on Tuesday of this week. When asked if she was aware that she "broke the Internet," so to speak, Didion responded, "I don’t have any clue. I have no idea." Something tells me the same could not have been said of Kim Kardashian when her Paper magazine cover hit the Web. The photo in question is an elegant Juergen Teller shot of the slender Didion sitting in her Upper East Side apartment sporting a black turtleneck, statement necklace, and signature gray bob and oversize sunglasses. She also hasn't been retouched, so she can safely claim she #WokeUpLikeThat. It's pretty impressive when you consider that she looks that great at 80 years old. Here are some of those adoring tweets you missed, Joan!